The early ’80s saw three different anarchist newspapers in Haringey. In 1984/5 there was the aptly named Soci@list Opportunist which lasted for six issues. Then there was Haringey Anarchist News in 1986 followed by Haringey Free in 1987/8. During this time the Trades Union Centre in Brabant Road was used for gigs and meetings and although not directly anarchist there was a local bookshop that stocked a number of anarchist books and magazines (Reading Matters). 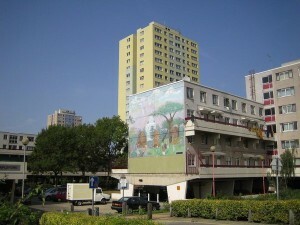 The Unwaged Centre on West Green Road then became the hub of the anarchist and anti-authoritarian movement in the borough with many groups such as the Claimants Union, Haringey Short Life Users Group (collection of short life housing co-ops), Haringey Women’s Group and others involved. Squatting of homes and factories for living and parties has always had a strong tradition in Haringey from at least the early ’80s. Initially starting with Tottenham Solidarity Group, other groups soon formed into Solidarity Groups later coming together as one single group Haringey Solidarity Group (HSG). Again not specifically anarchist, these groups tried to be as open as possible and were more concerned with having local people involved than pushing a single line. Although for 25 years HSG has always kept the principles that they are not connected to any political group or party and “our aim is to promote solidarity, mutual aid and link working class struggles. We can’t rely on politicians or leaders to do things for us”. Throughout HSG has had three main strands to its activities. To start local campaigns and link up with similar campaigns nationally; to support groups or individuals within Haringey; to help similar groups set up in London (and sometimes further afield). There are too many campaigns HSG have been involved in over the years to mention them all. Likewise, for the number of groups and individuals we have acting in solidarity with. For any historians out there all the leaflets, posters and newsletters produced are available. From the early ’80s a number of issues have always been important including housing/squatting, worker’s solidarity, anti fascism, claimant support and others. Like our comrades from the ’80s we still believe in propaganda. HSG have distributed a local newsletter since 1992 (Tottenham Community Action then Totally Indypendant). These have always been given out free on the streets of Haringey and at its height 12,000 copies were distributed four times a year. HSG have probably given out hundreds of thousands of leaflets on a huge and diverse range of subjects. And as all good anarchists should, tens to hundreds of posters have magically appeared on bus stops, billboards and walls regularly. Haringey Solidarity Group will, as always, have a stall at this year’s London Anarchist Bookfair. Hunt us out especially if you live locally. Otherwise check out the website at: www.haringey.org.uk. For another view of local anarchist activities over the past 30 years check out: katesharpleylibrary.net/cvdp18. The booklet “The Poll Tax Rebellion in Haringey” is still available from HSG. This article first appeared in the Winter 2016 edition of Freedom anarchist journal — Summer 2017 issue out soon!